There’s one line from a baby care bible I used to refer to in those heady days as a first-time mum that still cracks me up. It’s the line that said, in all seriousness, that a breastfed baby’s poo smells like newly mown grass. Now, I’m not one for deliberately inhaling the contents of my children’s nappies, newly mown grass or no. What I can tell you is that any comparison to the fragrance of a meadow ends when your baby starts solids. Yep, any parent who’s started down the mashed banana-mixed vegies road will tell you it’s not long before those nappies take a terrible turn for the very worst. With three kids, you can believe we’ve had some doozies at out place. You know the ones – you gag and groan as you change them while asking how something like THAT could come out of something so small. And though you remove the offending nappy to the outside bin right away, the smell stays. My god, how it stays. No matter how many windows you open. And it only gets worse as your baby morphs into a toddler. So when the folk at trusted brand Dettol told us they were launching the Dettol Glen 20 healthy air system product to go with their well-known spray that gets rid of bad odours, we figured Babyologists might be interested. And when they told us their new product wouldn’t be out of place in the beautifully stylish nurseries so many of you create, we knew you most definitely would be. We all know Dettol Glen 20, it’s been around seemingly forever. And yes, it does really kill bad smells dead by neutralising them. 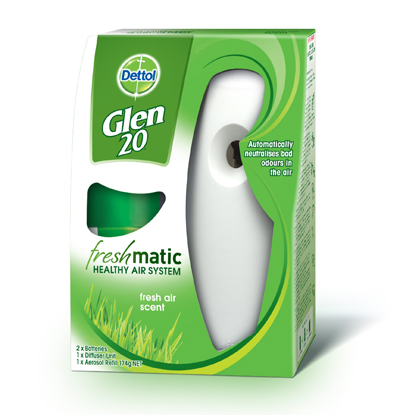 The new Dettol Glen 20 Freshmatic Healthy Air System hides the green can inside a neutral dispenser cover that blends in perfectly, whatever your nursery style. Just perch it inconspicuously on a shelf in your nappy change area and forget. The white dispenser automatically sprays a mist to neutralise obnoxious nappy smells. Of course, you’ll still have to change the actual nappy. But at least the aftermath won’t linger. You can find the new Dettol Glen 20 Freshmatic Healthy Air System dispenser and refills – there’s fresh air scent or clean comfort linen – at your local supermarket later this month.